I’ve always liked the beginning of that familiar Walt Whitman poem. I recall it with a smile each time I embark on a new trip, regardless the trip’s length. But this trip made me smile bigger than ever. It would be a great one! Travel time is sometimes a challenge for us. She lives far away in another state and is self-employed in a real job that requires her year-round attention. 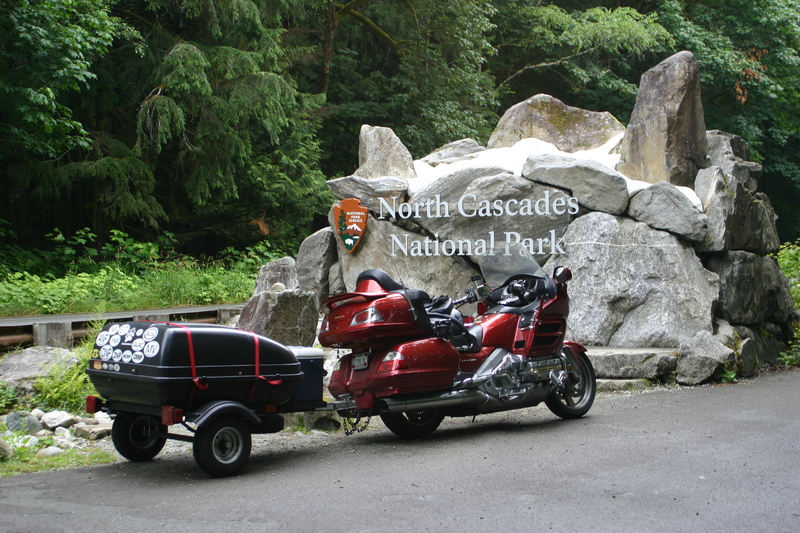 I live with the Gold Wing and have the perfect job for open-ended summertime motorcycle touring. I’m a teacher! She was going to have to check the calendar. As I mentioned before, being a teacher provides me the full months of June and July for this type of thing. And this year, I wanted to tour for as much of my summer as I could. I have friends in Phoenix who I wanted to visit. And one friend would let me use her home as a base for day-tripping. So, my summer in the sun … mostly, began on June 10 when I pulled out of my driveway, headed for Phoenix. Arizona was a huge surprise! (I’ll write more on that later.) After nearly two weeks of day trips, Diamondbacks baseball, and a visit to the GWRRA mother ship, it was time to pick Susan up at the Phoenix airport. And it was hotter than … well, it was hot – 111 degrees! Susan’s surprise was reflected on her face when she walked out of baggage claim. “Don’t worry,” I told her. “We’ll be out of this soon.” We threw her suitcase in the trailer, donned our helmets, and off we went. Flagstaff was our destination. We were camping there for a few days while we visited Sedona and the surrounding area. Flagstaff is due north of Phoenix and a gradual climb of 6,000 feet. And a 25-degree temperature drop! Huge Arizona surprise No. 1 – I thought Arizona was a giant desert! (I’ll write more on that later.) We spent a day enjoying Sedona’s charms and another even more enjoyable day in Flagstaff. We asked the locals about the Grand Canyon. They all said, “Oh, go, absolutely. But go to the north rim. It’s too crowded at the south rim, tour buses and all.” I always respect a local’s point of view relating to tourism. 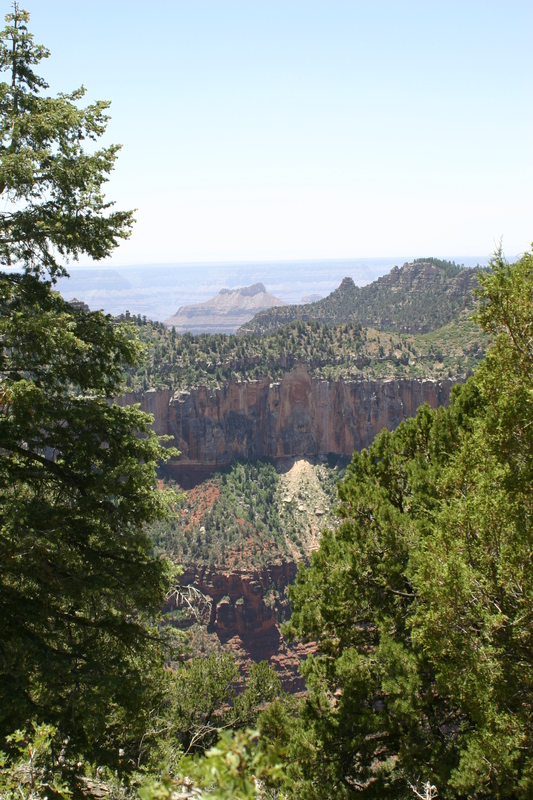 The north rim of the Grand Canyon is 200 miles one way from Flagstaff, and worth every bit of the trip – good road, excellent and varied scenery, and, best of all, very few tourists when we got there. When we wrapped up our stay in Flagstaff, we started heading in earnest for Lake Louise. On our way to Utah, we swung by The Four Corners National Monument, which was a pleasant surprise. After a couple of days at my son’s house in Herriman, we were on the road again, through Idaho and Montana. Our Canadian border crossing was on July 2 and we saw the first rain of the trip – all day rain. But the scenery was just what we expected – beautiful! We were heading for the Tunnel Mountain Campground in Banff National Park and passed through Kootenay National Park to get there. Our national park experience in Canada was very different than in the United States. Most U.S. National Parks we’ve visited are gated entry parks where a fee is charged for a visit. The four parks we visited in Canada also had entry and use fees, but main highways ran through them and motorists use these roads every day. Some Canadians live in towns and villages in the national park. So, while fees are collected to visit, many people simply drive (legally) past the fee kiosks toward their destination. Some U.S. Parks are similar, but not many. And fees in Canadian National Parks are charged by the day. You can pay for several days at a time, but the charge is by the day. This is also different from U.S. parks we’ve visited. Not a bad thing at all, just different, so if you choose to enjoy Canada’s beautiful national parks, be ready for the difference. Now it was time to visit our prime objective, Lake Louise. We made inquiries of the locals about the best time to visit, and they confirmed what our research had revealed: the best days are Monday through Thursday and the best times are before 8 a.m. and after 7 p.m. to avoid crowds. Locals are never wrong. We left very early for the 50-mile ride to the lake and arrived to see almost no one there. The sun was beginning to illuminate the glacier that feeds the lake. There was no wind, so the lake was like a reflection pond for the surrounding mountains. And the unique color of the water (due to rock flour) was spectacular in the ever-changing early morning light. It is no wonder Lake Louise is one of the top tourist destinations in the world. Put it on your list! The four contiguous national parks: Kootenay, Banff, Jasper and Yoho, all provided spectacular day rides. 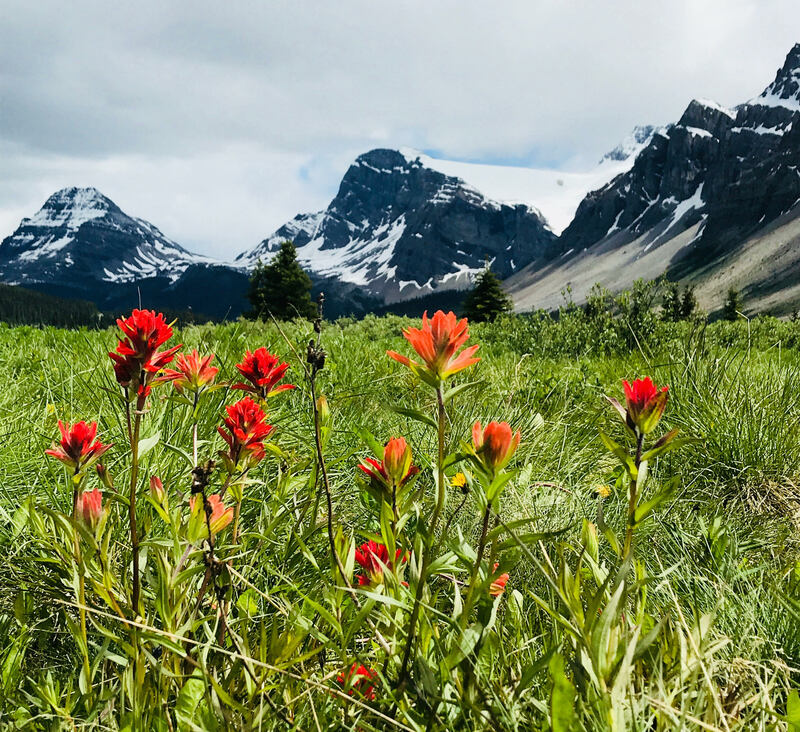 The Canadian Rockies were everything we had imagined – tall, wild and majestic. We passed through beautiful forests, desolate ice fields featuring glacier after glacier, towering mountains, and each park yielded something completely different from its neighbors. What a great stay! July 9 arrived. Susan departed the trip at the Calgary Airport and I continued on, through southern Alberta and British Columbia on my way to visit my daughter in Seattle. 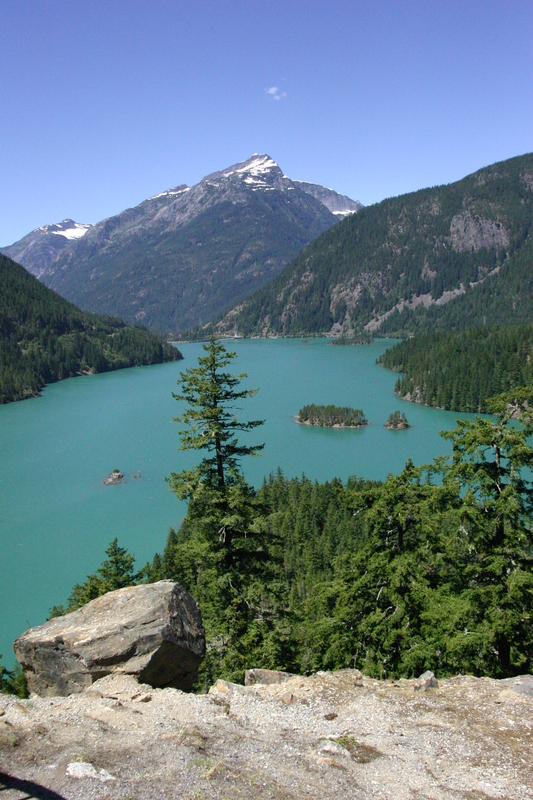 I passed through North Cascades National Park in Washington on my way. It’s a drive-through park with no entry fee. North Cascades is a little out of the way, but its beauty makes the trip worthwhile. Two days in Seattle saw me on the road, on my way to Herriman again. My trip was starting to wind down, but I still had several more touring days left. My objective now was Phoenix for a second time. And I was not particularly excited about it. I had promised a friend a visit on my return leg, and I was determined to honor that commitment. But I had also been monitoring the weather in Phoenix from the 70-degree splendor of Canada. There were big three-digit temperatures and flash-flooding monsoons to boot. Ugh! But a promise is a promise, so off I went. Besides, it’s a motorcycle trip. I’ve never, ever, had a bad one! I discovered “hammock camping” on my way to Herriman the second time. And I like it. I like tent camping as well, but I’ve developed a real distaste for tearing down a tent after a one-night stay. I don’t seem to mind setting it up for one night. I just don’t like taking it down after one night. (I know it’s weird.) Setting up a hammock is a breeze and taking it down is even breezier. Of course, you’ve got to have trees for a hammock, but if you’re a camper such as me, you might consider adding a hammock to your set up. I ultimately arrived in Phoenix and it was as expected – hot. By now I was wondering why anyone would live in Phoenix in the first place. My host wanted to visit the Tombstone/Bisbee area, so we made arrangements, got on the bike, and took off, to amazingly temperate weather. Another huge Arizona surprise! When I had day tripped earlier in Arizona it had been always in a northerly direction from Phoenix, and into mountains with pine trees and such. But this was south and east of Phoenix and still in the desert, just 3,500 feet higher in altitude. To my surprise, I was becoming a fan of Arizona. Not of the Diamondbacks or the Cardinals, mind you. Red Sox and Cowboys for me! But I really enjoyed riding in parts of Arizona not called Phoenix. Now, to be fair, I have been to Phoenix during spring training, and it is quite nice. But as I stated before, I thought the whole of Arizona was a big, hot desert in the summer. Boy was I wrong. It seems you can ride an hour and a half out of Phoenix in just about any direction and be in pretty scenery and 10-degree cooler temperatures. It’s safe to say I’ll ride to Arizona again. By now, July was just about gone, and I needed to return home for the beginning of school. So I headed east for the final two days of my summer in the sun … mostly. I returned to my driveway late afternoon of the 46th day – 10,600 miles behind me. Man, what a trip! Now that I’ve been back a little while, I’m struck by questions people ask. Two questions seem to be most common. First, people ask, “Wasn’t that the trip of a lifetime?” Man, I hope not! I have so many more places to go, so many things to see! Then, people want to know, “What was your favorite part?” That’s a much harder question. After such a long time in so many places, how can I hang the term “favorite” on any one thing? I thought about this question a lot and I concluded that the extremes of the trip were my favorite part of the trip. I rode from the Great Plains to the Pacific Ocean. I rode from our border with Mexico to our border with Canada and beyond. I rode from sea level to 10,000 feet. I rode in temperatures from 38 degrees to 114. I rode in table-flat deserts and majestic, craggy mountains. I traveled roads that were arrow straight, and roads so hair-pinned they seemed to double distance, as the crow flies. I rode past sagebrush and saguaro cactus, and through dense forests of 80-foot fir trees in the Northwest. Yep, the extremes were my favorite part of the trip. That and the fact that I covered every inch, saw every sight, smelled every smell, felt everything from the saddle of my Gold Wing. Posted 02/18/2019 by staff & filed under Road Trips, Uncategorized.